I can't say it enough. I'm so thankful to be part of such a great group of caring souls. I hope you all have a wonderful day with lots of good food and making memories that will last a lifetime! Love to you all, and Happy Anniversary, CC and JSM! Hey ya'll crazy monkeys. Happy Thanksgiving to all. Can you believe JSM and I will have been married five years in two more days? Happy Anniversary CC & JSM. WOW five years. Hope you guys have many more wonderful years ahead of you. Hope you all have a wonderful day. God Bless You All. Part of the group is going shopping....and a few of us are "doing genealogy". What is everyone doing today? Did you have a good day with more than enough food? I am doing genealogy tonight. Had to take a break from it. How does an entire family disappear after the 1900 census? I have looked everywhere and cannot find a single one of them. Frustrating. Sounds like you had a wonderful Thanksgiving! WOW Klaas That is awesome. What a wonderful tradition for your family. They look wonderful. What a beautiful tradition! 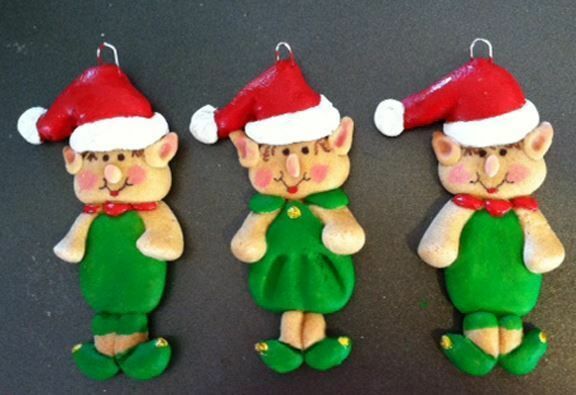 What other ornaments over the years have you made? I have 24 Minions to paint today. Then I have to personalize each then spray varnish, let dry then package for shipping. I have an OLD Seal a Meal (from the 70's) I use to make envelope/pockets out of bubble wrap. I put each ornament in it's own pocket, staple it closed and put one of those small bows and a name tag on it. It's a long process. Mix or sift together the flour and salt completely. SLOWLY add the water a little at a time while stirring. You might need a little less or a little more water depending upon the humidity. Note: you don't want the dough to be too sticky. KNEED the dough just like you would for bread dough until smooth. Put in a plastic bag. You can store it in the refrigerator for a day or two but any longer and it gets too sticky to work with. It's easiest to work with at room temperature. Working on the cookie sheet you are going to bake them on, shape into desired shapes. I roll balls then flatten, etc. OR, you can use a rolling pin and cookie cutters but that's cheating, LOL You can use toothpicks or other things to make impressions in the dough. For the Minions I used the end of a sharpie to make the round eyes for the glasses so I'd have a better chance at making them uniform and round. Once you are finished with your shape, take cutters and cut a paper clip in half and place in the top of the ornament for a hanger. Put in the oven at about 265 degrees or so until hard, about 2 hours, depending upon your oven. Take out and let cool. Remove from cookie sheet and paint with desired paints. You don't have to varnish, they will be fine without varnish. I use water base Craftsmart paint from Michaels but any water base paint will work fine (you should see how much paint and how many brushes I have, LOL). If you are going varnish, hang on a metal hanger and take outside to varnish. I use Minwax Helmsman Spar Urethane Clear Gloss but Krylon or any urethane will work. Let dry completely before handling or packaging. P.S. It's actually harder than it looks BUT it is a blast. I did it with my grand daughter a couple weeks ago and she had so much fun. She made a Mickey Mouse face. 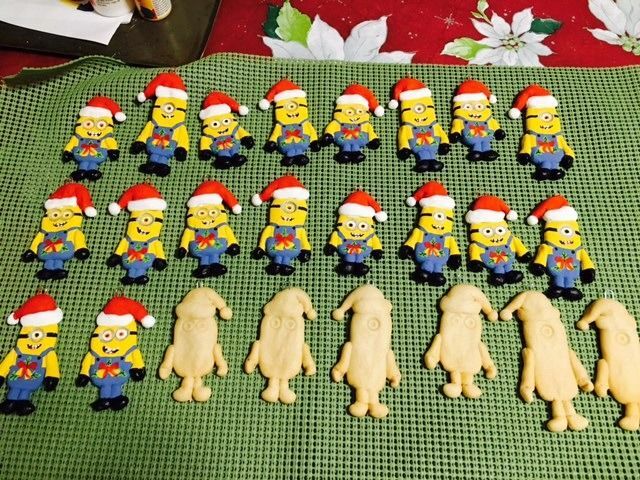 Some of my favorite Christmas memories are making these with my boys! I couldn't imagine making them for everyone though! Lots of work! You're da bomb! I just saw this. Happy belated anniversary ya'll!!! Klaas, those are so beautiful. Wished I could do something like this. What a great Xmas present for your family. You are one talented person. Bearly we are all praying for your great nephew. This is a difficult time. Hugs to all of you. I sent this to the nuns in my sister's community. They are praying for Eric also. Prayers going out for your great nephew and the family. May he have a speedy recovery. Prayers that God guides his surgeons.